Welcome to the Governors’ area of our Federation. 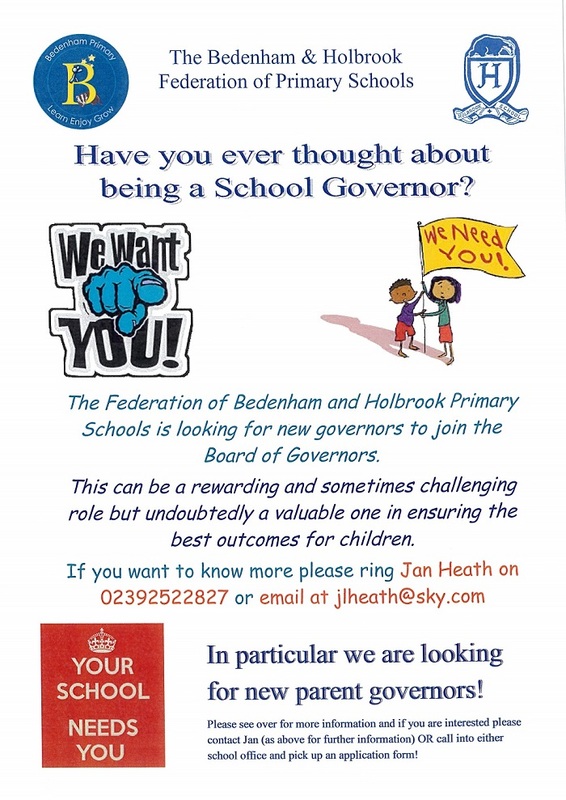 There is a single governing body for the Federation of Bedenham & Holbrook Primary Schools, and the current governors are very committed, have considerable skills and experience, and undertake regular training to ensure their knowledge is kept up to date. The Governing Body (GB) constitution consists of 15 places made up of 1 parent from each school, the Executive Headteacher, 1 staff member, 1 Local Authority and co-opted governors, who can also be parents or staff. The Heads of School are Associate Members who attend all meetings. The GB meets each term and is supported by various sub committees which governors also attend. Our governors also choose a curriculum subject or policy area to evaluate and monitor throughout all school year groups. Governance is about overseeing the success of the school. It is about agreeing priorities and monitoring progress towards them, providing constructive support and challenge to leaders and managers to enable them to do their job to the best of their ability. be transparent and accountable, including in terms of recruitment of staff, governance structures, attendance at meetings, and contact with parents and carers. The governors are encouraged to be visible within both schools as often as possible, however, if you would like to meet or chat to any of our governors, please get in contact with either of the school offices. Whilst we strive to keep you fully informed and up to date as much as we can, if you have any feedback or suggestions for our GB, please put them in writing to the Chair of Governors and give to either school office. Please note, any issues you may have should normally be raised with our school staff in the first instance, but if you are not sure how to proceed, we will be pleased to provide advice and look forward to hearing from you.